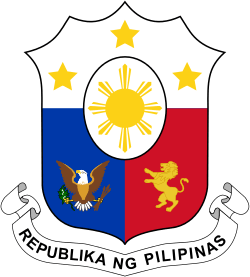 Eastern Visayas (Filipino: Silangang Kabisayaan, Waray: Sinirangan Kabisay-an; Cebuano: Sidlakang Kabisay-an) is an administrative region in the Philippines, designated as Region VIII. It consists of three main islands, Samar, Leyte and Biliran. 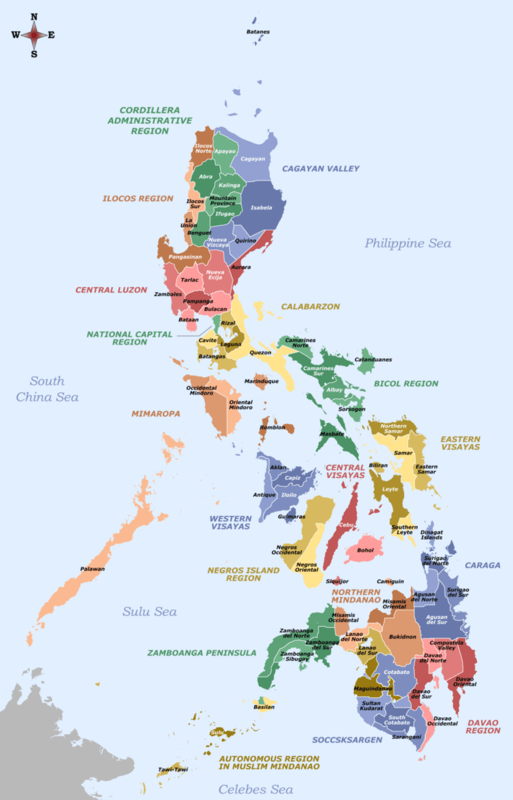 The region has six provinces, one independent city and one highly urbanized city  namely, Biliran, Leyte, Northern Samar, Samar, Eastern Samar, Southern Leyte, Ormoc and Tacloban. The highly urbanized city of Tacloban is the Eastern Visayas Regional Center (EVRC). 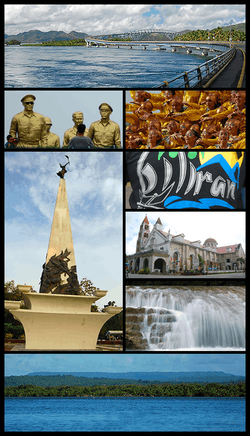 These provinces and cities occupy the easternmost islands of the Visayas group of islands. Eastern Visayas faces the Philippine Sea to the east. The region is known for its famous landmark, the San Juanico Bridge, dubbed as the "Most Beautifully Designed and Longest Bridge in the Philippines". As of 2015, the region has a population of 4,440,150 people. Eastern Visayas lies on the east central section of the Philippine archipelago. It consists of two main islands, Leyte and Samar, which form the easternmost coast of the archipelago. It is bounded on the east and north by the Philippine Sea with the San Bernardino Strait separating Samar island from southeastern Luzon; on the west by the Camotes and Visayan seas, and on the south by the Bohol Sea with the Surigao Strait separating Leyte island from northwestern Mindanao. It has a total land area of 2,156,285 hectares (5,328,300 acres) or 7.2% of the country’s total land area. 52% of its total land area are classified as forestland and 48% as alienable and disposable land. Waray-Waray is the lingua franca of the Eastern Visayas Region mostly spoken on the island of Samar, Biliran, Tacloban and north-eastern Leyte. A Sama language, distantly related to the languages of the region, called Abaknon is spoken in the island of Capul in Northern Samar. Cebuano is spoken in western and southern parts of Leyte and in Southern Leyte. Other languages spoken in Eastern Visayas are Baybayanon, a language related to Waray-waray, which is spoken in Baybay with 10,000 speakers and Kinabalian, which is spoken in the municipality of San Juan, Southern Leyte. 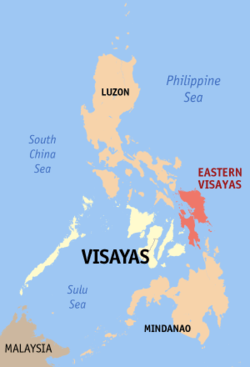 Eastern Visayas consists of 6 provinces, 1 highly urbanized city, 1 independent component city, 5 component cities, 136 municipalities and 4,390 barangays. † Tacloban is a highly-urbanized city; figures are excluded from Leyte province. 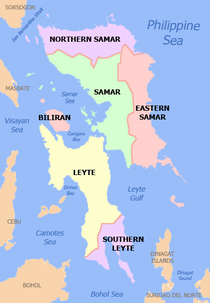 Figures for Leyte province include the independent component city of Ormoc. Eastern Visayas is primarily an agricultural region with rice, corn, coconut, sugarcane and banana as its major crops. Primary sources of revenue are manufacturing, wholesale and retail trade and services. Mining, farming, fishing and tourism contribute significantly to the economy. Manufacturing firms include mining companies, fertilizer plants, sugar central, rice and corn mills and other food processing plants. Tacloban is the hub of investment, trade and development in the region. Other industries include coconut oil extraction, alcohol distilling, beverage manufacture and forest products. Home industries include hat and basket weaving, metal craft, needlecraft, pottery, ceramics, woodcraft, shell craft and bamboo craft. Eastern Visayas is home to several state universities, including the prestigious University of the Philippines Visayas Tacloban College. The region is also home to the University of Eastern Philippines (UEP), located in Catarman, Northern Samar, which holds the most number of baccalaureate and post-baccalaureate courses among universities in the region. The Zonal Agricultural University for the Visayas under the National Agriculture Education System concept, Visayas State University (VSU) is also in the region, located in Baybay. Also, the region is home to Palompon Institute of Technology, a maritime school in the Philippines providing deck and engine cadet. Its main campus is located in the municipality of Palompon, Leyte province. The Eastern Visayas State University is Leyte's state university with five extension campuses. Southern Leyte State University with five extension campuses, is the only state university in the province of Southern Leyte. In Biliran, Naval State University is the province state university. For Eastern Samar, the Eastern Samar State University is the only state university of the province with a single extension campus while Samar State University is Samar's state university with two extension campuses. For normal education, the Leyte Normal University specializes in education courses. The region's Leyte and Samar islands serve as main link between Luzon and Mindanao by land transport. A total of nine airports, are strategically located in different parts of the six provinces that define the region. Daniel Z. Romualdez Airport in Tacloban is the main gateway by air to the region. There are seaports in Tacloban, Catbalogan, Calbayog, Borongan, Allen, Ormoc, Bato, Hilongos, Maasin, Sogod and Naval. The region is the top producer of geothermal energy supply in the country. The province of Leyte hosts the biggest geothermal plant in the Philippines. Still, geothermal exploration is ongoing in the nearby province of Biliran. With abundance of river system, the region has potential in hydroelectric production. The strait of San Juanico between Leyte and Samar islands has been declared as potential source for water current and tidal energy sources. Tinikling, the Philippines' national dance is folkdance that originated from the region. But the most popular cultural dance among Warays is the Kuratsa, danced during feast celebrations and special gatherings. The Leyte Kalipayan Dance Company, a local cultural group, held highly successful performances around the world. Waray people are music lovers whose folkloric music are mostly ballads in form, famous of which is Dandansoy while Iroy nga Tuna (Motherland) is a patriotic song. 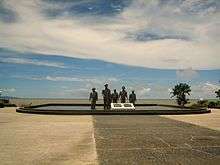 MacArthur Landing Memorial National Park, Is a war memorial that commemorates the historic landing of General Douglas MacArthur in Leyte Gulf at the start of the campaign to recapture and liberate the Philippines from Japanese occupation on 20 October 1944. Agas-Agas Bridge, the highest bridge in the country, located at Barangay Kahupian, Sogod, Southern Leyte as part of the Maharlika Highway. 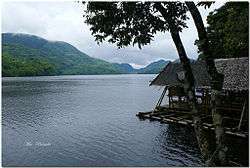 Lake Danao is a guitar-shaped lake on the hills of Ormoc in the province of Leyte. 1 2 3 4 5 "Region VIII (EASTERN VISAYAS)". Census of Population (2015): Total Population by Province, City, Municipality and Barangay (Report). PSA. Retrieved 20 June 2016. ↑ "Population and Annual Growth Rates for The Philippines and Its Regions, Provinces, and Highly Urbanized Cities" (PDF). 2010 Census and Housing Population. National Statistics Office. Retrieved 10 August 2013.